• Latest death toll reaches 107 rangers killed in the line of duty from July 2017 - 2018*, yet almost half (47 per cent) surveyed have no life insurance to safeguard families left behind. LONDON: As nature continues to decline across the world, worsened by unrelenting levels of illegal logging and rampant poaching, wildlife rangers are one of the planet’s last line of defence. However, ahead of London’s Illegal Wildlife Trade Conference this week, results from the largest ever survey on the working conditions of government rangers across Asia and Africa reveal the harsh realities of their work. Lack of basic needs such as shelter and clean water are among some of the starkest findings, as 60 per cent and 58 per cent of rangers interviewed, respectively, reported having rare or no access to either of these while on patrol. Life on the Frontline, takes an in-depth look into the challenges rangers are up against; poaching gangs, infectious diseases, lack of training and equipment, and at times, challenging relationships with local communities. Carried out by WWF with support from Ranger Federation of Asia and the University of Central Florida, the survey covers more than 4,600 government employed rangers across 294 sites in 17 countries spanning Asia and Africa. The survey found that globally one in four wildlife rangers had contracted malaria in the last year, with 80 per cent indicating they have little or no access to mosquito nets while on patrol. When looking at the breakdown by region, in Africa, a staggering 72 per cent had suffered from malaria; this drops to 16 per cent in South Asia and 12 per cent in Southeast Asia. “These men and women are on the frontline, risking all to protect nature and wildlife. This survey and its eye-opening findings will be game-changing if governments take note of the results and immediately address basic healthcare and ranger needs. We’re losing nature rapidly and are in the midst of a poaching crisis; rangers need the training and equipment that reflect the severity of their jobs. We must remember there is a lot at stake if governments fail them,” said Margaret Kinnaird, WWF Wildlife Practice Leader. “The problem faced by rangers during patrol is that we don’t have adequate equipment to perform our work, like boots and raincoats,” said a ranger who wishes to remain anonymous. The survey also highlights the importance of relationships between communities and rangers. Taking the global average, over 80 per cent of rangers recognize that part of being successful at their jobs depends on the community providing them with information, and 78 per cent believe that the community members trust them. However, one in three have been subjected to verbal abuse, bullying, harassment or have received threats from local communities while on patrol. In addition, 9 per cent have experienced physical violence, although it’s worth noting community members may, in some cases, have been conflated with local poachers which could lead to a possible inflation of these numbers. 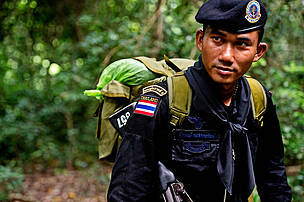 “Improving the relationship between rangers and local communities is a top priority. Rangers can’t protect protected areas without the support of local communities and indigenous people who live in and around these areas. We are working on various approaches that can help build partnerships between communities and rangers but governments need to step up and help amplify these efforts which must extend beyond conservation to achieve lasting impact,” said Rohit Singh, Zero Poaching Lead of WWF and President of Ranger Federation of Asia. Ahead of the upcoming London Conference on Illegal Wildlife Trade, WWF is calling upon governments to urgently review and address shortcomings that are endangering the lives of rangers and as a result, nature and wildlife. Adequate training, including widely adopted first aid training for rangers, strong emergency medical treatment plans, as well as equipment and communications devices appropriate for field conditions should be among the matters urgently reviewed. Additionally, 100 per cent insurance coverage for serious injuries and loss of life is critical for rangers and their families, and governments must look to facilitate the trust and improve relationships between rangers and indigenous peoples and local communities. WWF aims to work closely with governments and other concerned partners to address the issues outlined in the survey and ensure rangers are supported as other public service professions putting their lives on the line to work toward providing us all with a better world. Images and spokespeople available at request.